I have one of these but don't know how long to put then in the microwave for hard boiled. I live in a Retirement Community where we have all 3 of our meals prepared daily. I have a microwave in my room and I love hard boiled eggs. I saw this in your catalogue and had to have it. It cooks great just 7 short minutes and I have hard boiled eggs. This product is awesome! I have had one of these for years and use it often. Fast, economical, easy to clean. Way better than boiling eggs in hot water on stove. This is the best egg boiler that I have found and I have tried several it's fast and simple. I bought three of them for making hard boiled eggs fast and the other one I gave to my daughter. Love it! This thing is perfect. For those who gave it a bad review, had explosions, etc., you should stay out of the kitchen. I've used this for over one year without a hitch. It cooks the eggs perfectly, and without fail. If you're looking for a way to make a couple of hard/soft boiled eggs quickly and easily....this is the ticket. I use this item all the time as I like to keep hard boiled eggs on hand in the fridge for salads. Does a terrific job and easy to keep clean. It is wounderfull for my self, I have a learning disablity, the egg boiler is great for me. Ilove it. This is the easiest thing to use and I'll probably never boil eggs the old-fashioned way again. Have used it many times and the eggs are perfectly done and peel perfectly. I leave it in the microwave until it's cool enough to handle, as the instructions say. Will give one to an elderly friend who has been known to forget eggs are boiling on the stove. I'm sure she'll love it! I like using mine so much, I bought 2 more to give to family members. I wish I had this when I lived in a dorm in college and only had a microwave to cook food. This is easier than boiling eggs on an oven. I have a 900 watt microwave and it took 8 minutes for 4 eggs to become hard boiled. Very easy. I purchased this item over a year ago and I love it. My granddaughter comes to my house every Wed. and she loves hard boiled eggs, so I use it every week since I also like them on salads. It cooks 4 eggs evenly in 7 mins and they peel easily compared to boiling them. I love that part. I plan to buy more as gifts for my family. A favorite in my kitchen......really like it !! Don't know what u want. I use this cooker when I only want a few hard cooked eggs for salad or sandwiches. My microwave may not be as hot as the newer ones as it takes 8 min. for perfect hard cooked eggs. I love it. I have a small microwave with only 800 watts. I put the eggs in, set the timer for 7 minutes and the eggs come out perfect. Much better than watching water boil on the stove. Eggs come out perfect-however, before I ordered I read the reviews-two stated their eggs perfect-they were timed 7 to 7.5 minutes and then left in microwave for 14 minutes. The 1st time I did the 7 minutes. Eggs were cooked but yokes were a little soft. 2nd time I cooked them for 7.5 minutes and they were perfect. (both times I left in microwave for 14 minutes after cooking time was up) As everyone's microwave is different, you have to experiment. Try one egg 1st. To those who said it didn't work you didn't cook them long enough-try again. I have used mine everyday since owning and have had perfect eggs every time. HOWEVER-BE CAREFUL TAKING OUT OF MICROWAVE -IT IS HARD TO GET OUT OF MICROWAVE-PICK UP FROM BOTTOM -IF YOU PICK UP FROM MIDDLE IT COMES APART AND SPILLS HOT WATER ALL OVER MICROWAVE AND YOU. THEY NEED CLASP TO KEEP IT CLOSED. This it the greatest invention ever made. I have 2 of them. I like my eggs medium boiled. I can cook them perfectly every time. I cook for 6 minutes and then wait one more before cracking. This is much faster than boiling. I also hard cook eggs perfectly. There is no better way to cook a few eggs in the shell than this cooker. I use this product often and recently purchased a 2nd one for a friend. It works great and is really time saving. I love boiled eggs and this way is so easy, safe and accurate. Use just about every day! Had this for over 20 years, still going strong! I love the ease of this cooker!!!! Love it! This product is everything it claims to be. I live in a retirement facility where we are not allowed to cook in our apartments. I love hard bolied eggs and this was the only way to get them. Thanks for a great product. Cook in microwave for 7 minutes, take out and let cool, and you have 4 perfectly cooked hard boiled eggs. Keeps the kitchen cool. Love this product! Best egg boiler I've ever used!!! Used for 5+ years, every day. Saved pots that I use to burn because I would forget I had on the stove. Probably saved my house from burning down. Unfortunately, I've given it away to an amazed family member and unable to find it in the local store. I would be nice to replace it as soon as possible. 'I'm a boiled egg junkie'!!! 2 Large eggs, high 2 1/2 mins. Then 6 mins. at 70% power. Let set about 10mins.Two jumbo eggs 3 1/2 mins. on high then 8 mins. at 70% power. Let set about 10mins. Eggs have a different consistency,very moist and tender, and a whiz to peel. Love this cooker!! 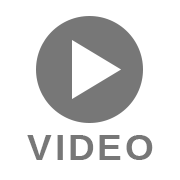 i love hard boiled eyes, here you can fix 4 at one time in 8 minutes. and they are so easy to peel. I brought and gave away 10 of them this year for Christmas gifts. I just ordered me another one. So I can do 8 eggs at one time. Actually works like it is suppose to!!! We bought this to use in our RV. Used to use an electric hot plate. Took 30-40 min to hard boil some eggs and cool. Have used this 3 times to try it. 8 min in a microwave. Eggs are perfect and all have peeled very easily.Very happy we got it.You just let them cool. You don't have to run water over them. this should be called "my magic egg cooker"
This morning, I used it for the first time, I tried with 2 eggs. I ran it for 6 minutes, then let in sit the micro for 10 minutes, using a timer. The eggs were hard boiled, which is what I wanted. Use with common sense. It's wonderful. I purchased the Microwave Egg Boiler in November, 2015. It's now July, 2016 and I am still using this product on a regular basis. It did take a couple of tries to get the timing correct, but that has to do with the microwave being used. With mine, it's best to go with 7 minutes on High. (Your microwave may be different!) The eggs almost always turn out perfect and almost always peel perfectly. Once in a while one egg will have a tiny burn spot or one may peel a bit unevenly. However, this would seem to have more to do with power fluctuations in the microwave. 98% of the time, the eggs are hardboiled perfectly. Super easy to use with easy to understand directions. Clean up is a snap. Be sure to heed the warning about it being hot after cooking, it is VERY hot so be careful. I love it! I made hard boiled eggs in this and they turned out perfect. I used large eggs and microwaved them for 7 minutes. I really like the egg boiler with my microwave. I can fix a few or several at a time and don't have to use lots of eggs. I bought some as gifts and I have 2 for my personal use and they are really great. I like the way it cooks with no mess. I was initially disappointed as this egg cooker does not fit in Sharp microwave drawers. I had a small bowl that fits the egg tray and the top and this worked like a charm as it reduced the height of the cooker down 1 inch and made it fit my Sharp drawer microwave. This is the best and easiest hard boiled egg cooker that I have ssen. I can cook 1-4 eggs at a time and it takes so little time (less than boiling or stovetop steaming) it is not a problem if you have to do multiple runs to get enough eggs. All of the electric cookers do not have an automatic shut off and I was prone to setting up eggs to boil and then forgetting. I needed something that would stop cooking after a set period of time. This is perfect. Even if I forget, the worst that has happened is that the yolk gets slightly grey if left in the microwave overnight (I did mention I tend to forget). The instructions are not real clear but typical for microwaves you need to test for your wattage. After 4 runs, I settled on 7 min at power 6. I can do 1 or 4 eggs and get consistent results. After doing 6 dozen eggs I have had only 3 eggs crack and leak. Two of the eggs cracked in one run and then after 3 perfect runs I had another egg crack. Not a big deal. Unlike boiled or steamed eggs on the stove, the amount of the egg that seemed to escape was less and there was a very limited mess and I just eat these eggs first. Likely these eggs had micro-fractures. I've had batches of boiled and steamed eggs that had 30% of the batch break so 3/72 eggs with limited breakage I am convinced that this is a better way to steam hard boiled eggs. The metal insert discolors after a few rounds and I actually like my set up where I am not using the plastic bottom to hold the water but use a ceramic dish. The top is plastic with an internal metal liner so I am less concerned by using the plastic top. I have recommended this to others but have indicated that they should find a ceramic bowl to fit rather than using the plastic water reservoir. As opposed to makeing 8-12 hardboiled eggs at a time, I find myself making 1-2 hardboiled eggs to make egg salad sandwiches or to just have the eggs on hand. Definitely worth the cost and I would not hesitate to give as presents. Have used it once, and works ok.
Fianlly, the perfect hardboiled egg! Makes the PERFECT hardboiled egg. No more green eggs. It's so easy. No more guessing the time, dealing with boiled over water or cleaning a pot. Just add water and pop it in the microwave. It makes 4 hardboiled eggs..once again the PERFECT amount. It diffinately helps me keep to my one egg a day protein snack. I'm recommending it to all my sisters and girlfriends. I bought two more of this product. I use this product to boil eggs and I get delicious and easy to peal eggs every time did my Easter eggs in a jiff. I cook a lot of boiled eggs and had seen this product wondering if it really worked in the microwave. Cooking eggs in the microwave can be a disaster. They will explode or over cook making them tasteless and rubbery. Not so with this product. I use it all the time and love it!! My second order for this item. I have reordered this item a second time -- for total of 8. I love the egg cooker so much that I wanted all of my friends to have one. Their feedback has been excellent!! The eggs not only cook quickly and evenly but, when peeling, the shells literally slip off. No more shells sticking to the egg whites. Cooks eggs perfectly every time. Great invention and, I highly recommend! Just add the water, place the egg holder, add eggs and top -set for 4 minutes and 20 seconds on an 1100 watt Micro wave and get perfect eggs. Love this cookker. Very handy & quick to use. Cleanup easy if you spray metal tray with oil. Once in a while an egg will open & spill out onto tray. Not the cookers fault. Once you get your cooking time right with your microwaves wattage & how you like them you'll really enjoy this cooker. Love to pop a few in for a quick dinner for myself when home from work & tired. Will be hot when removing from microwave. Be careful. I'm buying two for birthday gifts today. I know they will enjoy it as much as I do. Cooks hard boiled quickly. whetever you prefer. Love It! Should be named Gadget of the Century!! We use jumbo eggs so we cook for 8 minutes in a 1000 Watt microwave. Let it sit in the oven for several minutes, for cool down and a little extra cook time. Put eggs in ice water then back into the refrigerator. Cooked perfectly, and they peel perfectly!! You need trial and error to get your timing for your microwave. I would start with at least an extra 30 seconds and work up or down from there. Did I say they peel perfectly! Both my sister and my brother got one after I told them about it. Have one. Love it. Ordering 2 for gifts. Cook eggs in a hurry for potato salad. Easy and quick for breakfast. As several people have noted, the instructions are either bad or missing. So pay attention! :) It takes 8 minutes in my microwave, and there's NO trouble at all. I love this gadget and would never bother to make hard-boiled eggs the old-fashioned way. Plus, it's cute as heck, especially in a hen-themed kitchen. had to adjust the setting to 50% on t the power level -then cooked for 8 mins. then let sit for 20mins. then good to go!! love it!!! Ive had mine for a few years & love it. So easy to use. I fill it with water, insert the 4 jumbo size eggs & set it for 8 minutes. They have always come out perfect. The jumbo size has never been a problem. I have a 1100 microwave so you may have to cook it longer if yours is less wattage. I highly recommend it. 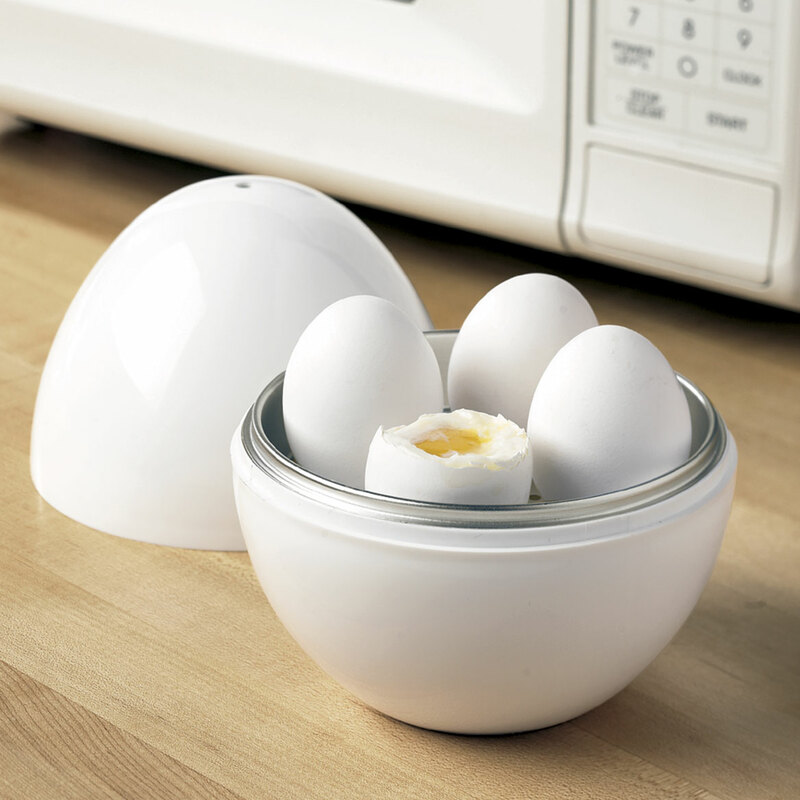 I love this for hardboiled eggs - I cook 4 at a time - takes 7 1/2 minutes to cook, then I leave it in the microwave with the microwave off for 14 minutes and the eggs are just the way I like them. Not only does this product cook boiled eggs perfectly, the shells slip off easily leaving perfect eggs every time! I highly recommend this product. I use the egg cooker weekly for family bag lunches. Never had a bad hard-boiled egg from this cooker. People love getting them as gifts. Egg cooker plastic gets a bit brittle over time if used a lot, but still hardly no complaints and I always have 1 or 2 on hand just in case. Perfect hard boiled eggs in microwave in 6 minutes. Eat 1 or 2 hard boiled eggs each day. Tried it at home but will use it in the RV. I use this twice a week, every week. I love it so much I bought 4 more to give to my friends as gifts. The eggs cook perfectly and the shells don't stick to the egg. NICE ! I ordered this hoping it would work in the mircrowave in the small galley of our boat. When I received it I immediately tried making hard boiled eggs at home. 8 minutes and the eggs were cooked to perfection and tasted great. The unit is smaller than I expected, you can cook 4 eggs at a time. There really is no clean up other than wiping the unit off to put away. We look forward to eggs for breakfast, hard boiled eggs for egg salad and deviled eggs all onboard the boat. Perfect results in 7 minutes for soft-boiled eggs! I cook only 2 room temperature large eggs at a time, one on each side of the cooker tray. Four minutes and 30 seconds on high in a 1000 watt microwave, let sit 2 minutes, use silicon tipped tongs to lift cooker top off and set on other side of oven or lift out, gently use tongs to lift eggs into bowl, run under cold water 30 seconds, peel and eat two perfect eggs--soft warm yolks, firm whites. Yum! cooked 4 boiled eggs in microwave in only 7 mins. My husband can't eat eggs, so I love them on salads, or deviled. I have one here, in our home away from home and our camper. The camper was a great idea because it doesn't heat up the area. I am a senior that lives in the basement bedroom of a three story house. This little gadget lets me have a great hot breakfast without climbing the stairs to my families kitchen. The most useful item I've purchased in a long time. Would be great for the college dorm. This Microwave Egg Boiler is just great. I am a single person, living alone and this egg boiler is perfect. Makes hard boiled eggs in 9 minutes and very little clean-up. I like it because I only want a few eggs, and it is perfect for that. This is the way to make hard-boiled, or even soft-boiled, eggs. No mess and no fuss. Perfect product and I've stocked up on 3 or 4 of these because they work so well. Eggs cooks in 6 min. and 35 sec. in my microwave. Always come out perfectly cooked with no green rings around yolk area. Shells remove easily. How it cooks and how long depends on your microwave not the product. I have a small 700 Watt microwave so Hard boiled eggs for me will be 15 minutes and 8 minutes for soft boiled. I've used this for a long time and love it. After screwing up a few times, I mistakenly microwaved at full power (1000 watts) for 7 minutes and found I got a perfect hard boiled egg. Have never had any mishaps using this method. Eggs will heat slowly via the steam since the metal inside the upper lid prevents the microwaves from heating the egg directly (so no eggs exploding!!) This is one incredible time saver- Love this product!! It's the easiest way to hardboil eggs - and in the microwave. I'm getting several for gifts! Since every microwave is a little bit different, it takes a couple of tries to get it right for yours. After that, every single time you use it, your eggs will be perfect and literally jump out of the shell. I have bought these for friends and they continue to rave about it! I just cooked my first eggs in this cooker. I was so surprised how easy and efficient this cooker is. I love it. My family loves egg salad and this is such an easy way to make hard-boiled eggs. They're perfect every time and the shells come off so easily. So much better than boiling water on the stove. I AM re-buying multiples of this product!! I am re-buying this as a gift for my youngest daughter who has moved out on her own so she won't have to borrow mine now every time she hard boils all the Easter Eggs for my granddaughters, as that was her job while she was at home and she knows how easy it was with this little appliance. Also, when we make Deviled Eggs, the ONLY time it's REALLY important that the Whites of the eggs can be peeled smoothly so that they are presentable on the platter, ONCE AGAIN, this Small, Inexpensive EGG Shaped Appliance is indispensable for that purpose in your kitchen. Through the years, I have tried Every other method suggested by Everyone, including Martha Stewart, Hints from Heloise, & Paula Dean, etc. etc., to get good results - even JUST to get eggs to peel Easily, much less flawlessly!! Here are my best Never FAIL hints: I always start out with Room Temperature eggs as I only hard boil eggs in-mass, not just for 1 or 2 in the morning for breakfast, so I plan ahead, they also say at least week old eggs peel better, but I don't always have that luxury. Room temp eggs keep them from exploding or cracking inside the cooker from the extreme temperature difference for such a long cooking time. My microwave is 1000 Watt so I cook 4 Large - XLarge eggs for 6 1/2 - 7 minutes and then they sit sometimes with the lid on for a while, sometimes not, cuz I don't peel them for a while anyway, but you can drop them in cold water after a while if you are in a hurry to peel, if desired. Pop them on the "larger bottom" of the egg on your drainboard as there is an air space there, and then all around the rest of the egg, and then it allows you to grab that space of cracked shell and started peeling. Also, if you peel your eggs under a slow stream of running water so as to keep the shell and eggs moist, it will help keep the whites intact, so they look nice, and make them SO much Easier to peel. Believe me, I've tried EVERYTHING Else!! When removing EGG Appliance from Microwave with potholders, Always lift from bottom half of Egg, cuz top half does Not have to be securely snapped on & just practice good sense! Everything is HOT, including eggs inside! I'm ordering myself another one so that I can have it ready & waiting to put in the microwave at Easter when dyeing many eggs for the Easter Rabbit & Thanksgiving for lots of good Deviled Eggs!! Love the microwave egg boiler and have reordered 4 more for gifts. Eggs cook perfectly and peel easily. Highly recommend! This item is awesome for the value. It works just the way the ad claims it would. So, easy to use. Love it! Bought one for my sister's birthday! Oh my... You want boiled eggs fast...then this is the product to get. 2mins and done. It is a quick way to have a boil egg. I use this egg boiler for the microwave and it is very handy. I see great potential for using the egg cooker. I never knew one was available that could be used in the microwave. I've not quite gotten the variables down yet (size of eggs, amount of time), but with some more experimenting, it will be soooo useful! Shells Slide Right Off Hardboiled Eggs!! Never before, no matter how many suggestions I have taken from TV or newspaper home-cooking experts, have I ever, been able to peel a hard boiled egg completely, without tearing the outside white part. When making deviled eggs and stuffing them, this makes a complete mess! With this small kitchen appliance, I never have this problem anymore. I put my eggs in this little steamer for 6-7 minutes, let them cool, and peel. The shells come off cleanly and completely. Granted, to prepare many deviled eggs, I have to steam many sets of eggs in the microwave, but how hard is that!! I ordered myself one, then my oldest daughter wanted one, and now that my youngest daughter is moving out, she wants one for her kitchen. Everyone should have one! I use it to hard boil eggs and the results are great as long as the heat is right. The instructions could be better. After trial and error I am able to make perfect hard boiled eggs. For two eggs in a 1,000 watt microwave, cook on high for seven minutes, then leave in oven for another ten minutes. The instructions kind of say that, but not directly. Really worked well. Eggs were perfectly cooked and easy to peal. I was skeptical to try it ,but it worked fine. Easy to use but needs a handle to remove from micro. Works pretty good = I use jumbo eggs so it took longer. Eggs seem harder to peel, but faster time makes up for that. Saves time and clean up. So far do good. Used once. Works best with xl and smaller eggs. The only comment I would add to the directions is to spray the dish with a cooking oil for easier cleanup and non sticking of the egg. Works great though. The product is excellent, but the tracking system was awful. Easy to use. Attractive design. Would suggest to put a plate under the appliance as it gets too hot to handle safely. i use it to make eggs for a tossed salad. The instructions are very confusing about the timing. After many trials and errors, I found 8 minutes at full (100%) power does it. I think my microwave is 1200 Watts. But you don't need to cut your power to 50% as the instructions say. It works great - eggs peel easily - I would recommend it to others - but not without telling them the timing and power usage. This is a great product. I hate to boil eggs on the stove. It is quick and easy to use. The only drawback is that you can only cook 4 eggs at a time. I like to have boiled eggs in my fridge. It's easy to have egg salad quickly. No pots to lift fill or empty. Now I have wonderful egg salad sandwiches for lunch. I don't have to get out a pan or turn on my stove. I like having hard boiled eggs on hand. Makes it easy to cook them and easy clean-up. SMALL EGGS MUST BE BEST BECAUSE LARGE EGGS TAKE FOREVER TO COOK IN MY MICROWAVE. TI DOES WHAT IT SAYS SO I THINK IT'S MY PROBLEM, NOT THE ITEM. I'm still working with this product to have the success with it that others have experienced. So far, I have only been able to fit 3 eggs in it; with 4 I cannot close the lid tightly. At 6 1/2 minutes, the egg yolks are still very runny; even at 7 1/2 they are very softer than I like. And my microwave usually takes less time than the suggested requirement. I think the key to it is that I need to purchase smaller eggs; the grocery store where I shop only has large or jumbo eggs. On the positive side, the eggs do peel easily if I put them in cold water immediately and peel them as soon as they are cool enough to be handled. It's been 6 days since I placed my order for items listed as "in stock" but was told today it may be 2 more days. Lot's of excuses. Also, it said free shipping but I was billed for shipping. Don't think I will be ordering from here again. I followed all directions adjusting the time as recommended, with no success. Both tries ended in raw eggs. throwing 3 eggs away that weren't hard boiled . Looks good but not efficient. Very disappointed in product performance. I tried and experimented with different times and power settings. Eggs cracked and made a mess. Very poor instructions. Don't waste your money. Received it bent a little bit and does not close very good. Plan to send it back. I couldn't use this product because I have a Little Litton, a very old microwave that was too small for the product to fit into. I thought it was also difficult to figure out how long. I am not good in math and expected it to be simpler to figure out how long to cook the eggs. Even my neighbor, who is very good at figuring out things like this, was unable to do this the first time. If my microwave had been large enough, I would have been able to experiment more with it. Too much whiz and not enough bang. No matter how long i boiled the eggs in this they turned out raw. I boiled for a total od 8mins. And still was not done. So i returned it. Even after 10 minutes at the recommended temperature, the eggs were still only about 10% cooked. I would not buy the product again. It did not fit properly and did not cook eggs. Only very small eggs can be used. I have an 1100 watt microwave; the instructions say 6-7 minutes for an 800-1000 watt. I put the eggs in for 8 minutes and they were still raw. I wasted 3 eggs trying to crack them open to see if they were done and they weren't. The problem isn't with my microwave - it's fairly new and most things take LESS time and require LESS power to cook than the instructions say (microwave is very powerful). Either instructions are wrong or product is defective. I'm sorry, but this is the worst piece of junk I have ever spent hard-earned money on. It is cheaply made & you can't use large eggs in it because the lid won't fit if you do. I'm going back to my tried & true method which actually takes less time. I love eating hard boils eggs that is why I bought this, but when I received the item, it looks so cheap, materials are not good and the tray where you place the eggs are too shallow and the sides are dented and sharp. I bought this on a whim & was very disappointed to receive a used unit, dried yolk on inside. Then, it would not sit up straight in the microwave. Tried to hard boil an egg. I TRIED FOR 7 MINUTES AND CHECKED 1 EGG, WHICH WAS SOFT. TRIED 1 MINUTE MORE, AND TRIED 1 EGG 1/2 HARD COOKED. TRIED ANOTHER AND WAS 1/2 COOKED. TRIED ANOTHER FOR 1/2 MINUTE AND LAST EGG WAS BURNED ON ONE SIDE. DO NOT BUY!!! WILL HAVE TO THROW OUT. Something different to me and I just wanted to try it out. Need to have quick and easy way to fix boiled eggs for special diet. Couldn't find locally. I have owned 2 in my life time and am so pleased that I wanted a friend to have one too. I cook with propane, using the microwave will save on that. I eat hardboiled eggs every morning for breakfast, so I cook a lot of them every month. always over cook boiled eggs. thought this might work. I’m tired of trying to get presentable eggs from stovetop cooking. Looked interesting--can't wait to try it. My friends have it and easy than boiling water in pan. So I order one. Already have one and needed a backup. We love this item. Have one, cannot find it, and it is positively genius! So, surely I can use another. Originally, a neighbor recommended it, and she loves hers as well. Quick and easy way to prepare boiled eggs for tuna salad, potato salad, etc. Friend told me about it. Also, I like ordering online. I purchased one of these and my daughter-in-law saw my husband using it and loved it. This one is for my daughter- in-law. I love soft boiled eggs and never get it right in a regular pan on the stove. I've had one of these for years and do love it. It took A few messes in the microwave to clean up until I mastered the time element involved. Well worth it, great eggs! 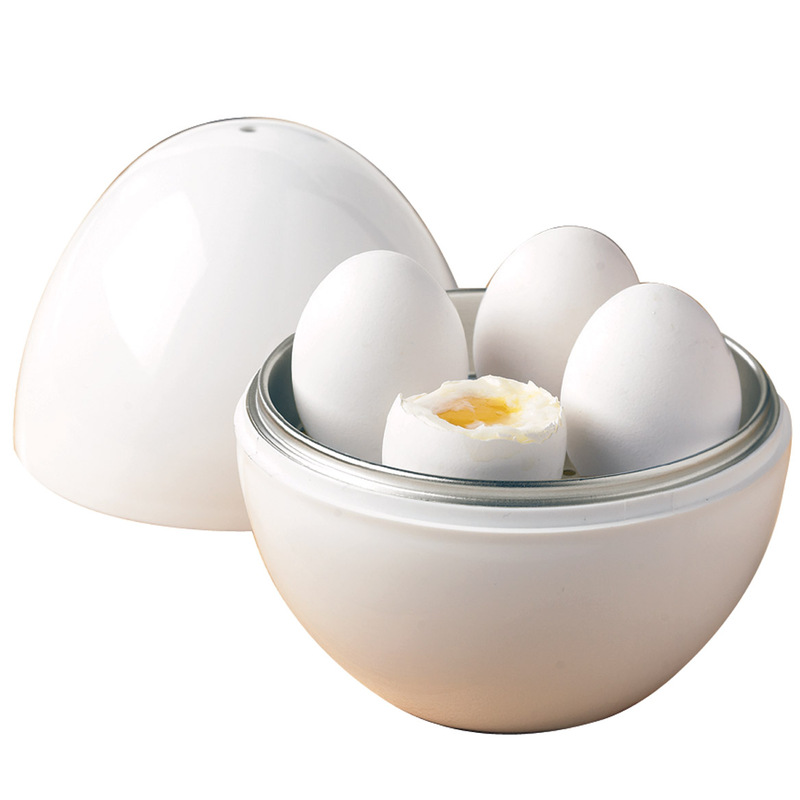 Love soft and hard boiled eggs and if this works in a microwave without burning, will love it. Family Members Had Seen it and thought it looked good. To quickly and easily prepare eggs. Do they all come with instructions? BEST ANSWER: Thank you for your question. Yes they do. We hope this information will be of help to you. How long for four eggs in the microwave? BEST ANSWER: The instructions with the Microwave Boiler - 800 to 1000 watts - says for Soft or Easy Boiled eggs -3 -4 min. I have not tried that; but for 800 -1000 watts - Instructions say: 6 to 7 minutes for 4 Hard Boiled eggs - That is not long enough for HARD BOILED - you need at LEAST 7 minutes, Probably 8 to 9 minutes would be better! I have found THAT you just have to try The Boiler several times - to get the eggs - HOW YOU LIKE THEM DONE!! I think that Altitude Might Play A Part in Boiling Time, Too - So Just Have some fun - If you get them done WELL ENOUGH - Make Deviled Eggs - Or if not & they are softer - you can put The eggs back into the microwave & cook them for the LONGER TIME - & Make Egg Salad for Sandwiches or for Salads or Whatever!! It Is A Good Egg Cooker - when you Get the RIGHT TIME OF DONENESS FOR THE EGGS You are Boiling!! Hope THAT HELPS! 4-5 min if not refrigerated. maybe 7 if from fridge. how long for 2 eggs? use it. Also it had no instructions. How long to hard boil 4 eggs in microwave in the egg boiler? BEST ANSWER: Microwaves variety. I cook 4 eggs 10 minutes. They come out perfect in both microwaves I use for cooking. Ten minutes. After the ten minutes let cool before opening top of egg cooker. Depends on your micro. I use 6 1/2 min and they are perfect. BEST ANSWER: The eggs will not exploDE as long as they have had a hole poked in the small portion end of the egg. I love my egg cooker. The eggs do not explode as long as you put the right amount of water. How long in microwave for soft boiled eggs? Try about six minutes for soft boiled eggs. How much water goes in cooker? BEST ANSWER: I'm not sure about that. Never did measure it, but I'd guess about 1 1/2 cups of water. Just fill to the line and I can boil 1 dozen eggs with that amount before adding more water. Love my egg boiler. The cooker comes with a handy cup which lists how much water should be added to make soft boiled eggs or had boiled eggs. It's very accurate and you can't go wrong with this product. to line marked--about one and a half inches down from top. You should be able to see it as there is a "bend" in the plastic. Hi, Just wonder what is the brand? is it Insta Emson? It has a line to fill to on the inside!!!! How many minutes for hard boiled in 1100 watt microwave? BEST ANSWER: hard boiled takes 6 minutes. I always keep hard boiled eggs in my fridge for making salads and my gluten-free daughter can always eat eggs when I have nothing else for her. No more than 6 minutes. Tried 5min 55 sec in a new microwave this morning and that has done well.